Former Charlotte 49ers standout Trevor Murphy shot a seven-over-par 77 in the third round of the U.S. Open at Bethpage Black in Farmingdale, N.Y., to fall out of contention in his first major championship. Murphy, who made the cut with the help of consecutive birdies on the 16th, 17th and 18th holes in Round 2 managed just one birdie in Round 3. He started the round with bogeys on four of the first five holes and added a double-bogey on the difficult 15th hole. The round of 77 dropped Murphy from a tie for 16th to a tie for 42nd entering the final round, which got under way Sunday evening. Murphy, who helped the 49ers to consecutive top 10 NCAA finishes in 2007 and 2008, has been playing on the Gateway Tour in Arizona. 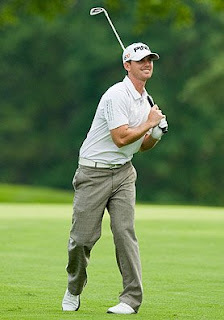 He competed in the PGA Wachovia Championship as an amateur in 2008, but missed the cut by two strokes. He lost a Lot of money the last 2 rounds. But, good for him and his ability to make the cut. Good Luck T-Murph. The experience was priceless. He will be back. Go T Murph! !